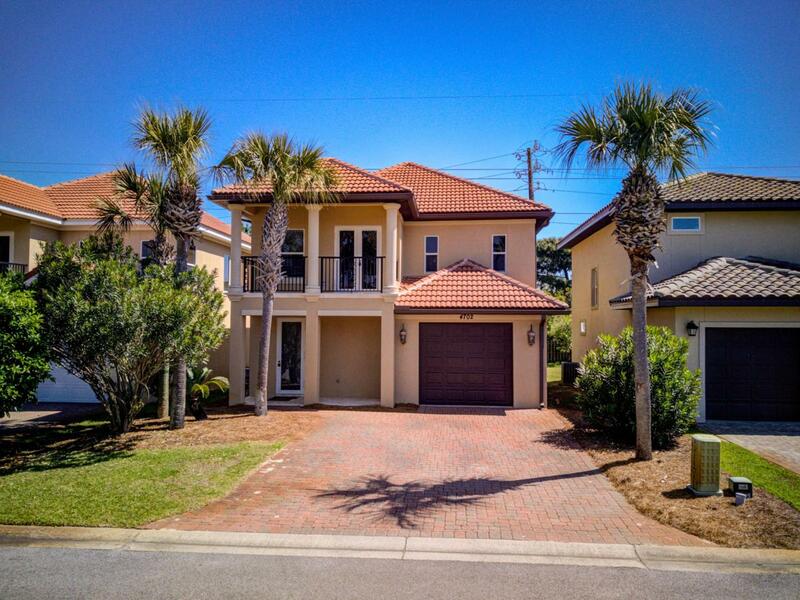 This attractive, Mediterranean-style home is based in a desirable neighborhood in a fabulous Destin location! Calusa Bay subdivision is north of Highway 98 across from Destiny East and not far from Regatta Bay, within easy access of many of Destin's best shopping, dining and resources--and of course the beautiful beach and sparkling waters of the Gulf of Mexico! This residence backs up to green space, including a jogging trail, and overlooks a lake. It features an open living/dining room/kitchen with travertine floors, black granite kitchen counters and a breakfast bar. All 3 bedrooms are upstairs, including the large master bedroom with dual sinks, a jetted tub and a large balcony. The home includes a one-car garage with storage space. Calusa Bay offers its owners a lovely poogated entry and a fantastic home base from which to enjoy the very best of the Emerald Coast!